I confess that I've been jealous of sports fans in cities like New York, Atlanta and Denver, who have been able to eat worry-free at Major League Baseball games for several years thanks to dedicated gluten-free stands at Citi Field, Turner Field and Coors Field. This season, it's Philly's time to join the club. 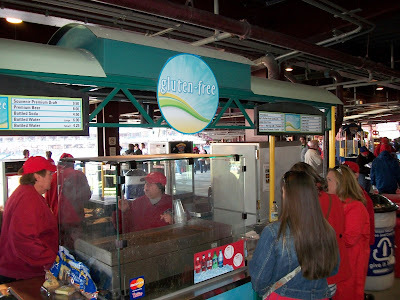 Located at Citizens Bank Park on the main concourse (Section 136), a dedicated gluten-free concessions stand brings together all of last year's offerings in one place. Phillies fans can get freshly grilled cheesesteaks and Hatfield hot dogs, pulled pork sandwiches, Seasons pizza, chicken fingers, peanuts, cookies and brownies. (The rolls and sweets are made by Sweet Christine's in Kennett Square.) In addition to soft drinks and water, the stand has Woodchuck hard cider on tap, Angry Orchard hard cider in cans and Redbridge beer in bottles. Elsewhere at the ballpark, the Chickie's & Pete's Crab Fries in Ashburn Alley are cooked in a dedicated fryer (and the cheese sauce is fine), and all flavors of Philadelphia Water Ice (available in Ashburn Alley and stands at Sections 106, 116, 132, 208/308 and 316/416) are gluten free. Hot dogs and salads are available at the Market Express stand (Section 321/421). The Phillies' home opener is this Friday afternoon against the Kansas City Royals. Expanded food selections are expected at Celiac Awareness Night on Friday, Aug. 16, when the Phillies take on the Dodgers at 7:05 p.m. Proceeds from sales of group tickets in the gluten-free sections will benefit celiac awareness. Kudos to Aramark, particularly Kevin Tedesco and Jeremy Campbell, for expanding the gluten-free choices at the ballpark and dedicating efforts to making the stand a reality this season.